New Delhi : Purnea Lok Sabha Vikas Parishad (PLSVP) conferred the winners of a statewide essay competition for school and college students of Bihar on Tuesday (January 16). The multilingual essay competition held in the fond memory of former Prime Minister Late Shri Atal Bihari Vajpayee, which was launched on October 2, last year and received a positive response from the students in the first year itself. 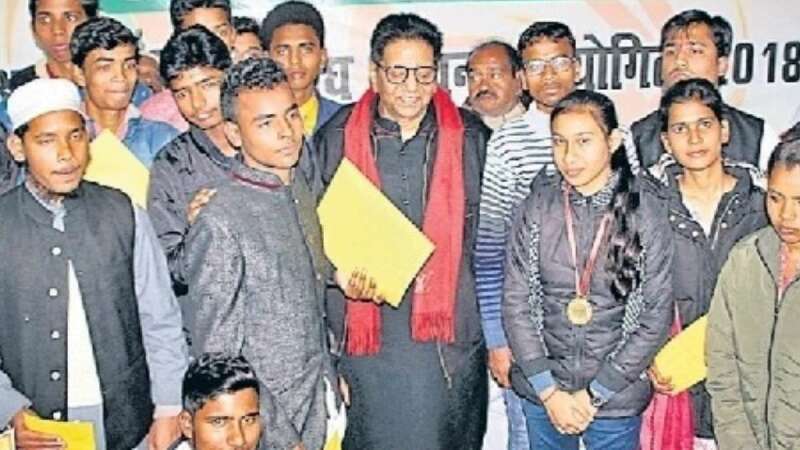 Former MP from Purnea Lok Sabha seat & PLSVP patron, Uday Singh, aka Pappu Singh selected seven school-level and seven college-level participants as the winners of the competition. The first-prize winners of college-level competition Shreyshri, Shail Kumari and Ghulam Mustafa were awarded a cash prize of Rs 50000 each. The winners under school-level category Mohd. Aarif and Rohit Kumar received a cash prize of Rs 25000 while Prem Kumar, Niharika Nigam were awarded Rs 30000 each. Sammi Kumari and Sonam Kumari were awarded Rs 15000 each, while Roshan Kumar was handed over a cheque of Rs 10000. The students were also conferred with a certificate of participation. The results of the competition were declared on December 25th, 2018 (Atal ji’s birthday). 18 participating students from Purnea district were also selected in the competition and they will be provided with a monthly scholarship of Rs 1000 each for the next 24 months.